High Pressure Stainless Steel Misting System- 1500 PSI. Create your own boltless aluminum box frame in 3 simple steps with Cloudmister aluminum extrusions and nylon corners. Our Tent Misting Kits are very economical and simply great way to stay cool under the sun. Perfect for any outdoor activities. Pre-assembled Tent Mister kits are made with high pressure UV protected tubing to insure longevity of the system. With easy up setup, it can be installed by anyone within minutes! Pool Cooler kit provides a lot fun, simple to install, readily attach-detachable and very economical way to cool the Swimming Pool Water temperature. 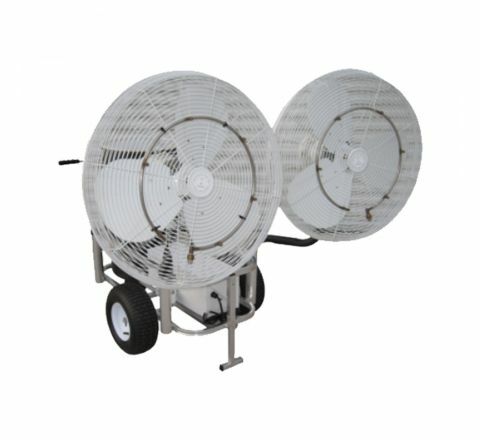 Turn any fan in to air chilling misting fan with use of our Fan Mist Kit! During hot summer months, most fans tend to blow hot air which adds to the misery. Simply attach our retro fan mist ring on the front grill of your existing fan and enjoy refreshingly cool air. (Up to 25 degrees cooler!) Now you can instantly create cooler and more confortable outdoor space without spending a fortune. Each Fan Mist Kit comes completely pre-assembled. Made with high quality UV Treated Flexible Tubing, Ultrafine Brass/Stainless Steel Misting Nozzles and includes 6FT of feed line with garden hose connector and filter washer. Attaches to any outdoor faucet/spigot or garden hose. Installation is a breeze. Simply attach the mist ring to your fan with provided ties and connect the feed line to any standard water source. Note: This fan mist kit not be used with a Booster Pump. It is designed to be used with standard household water pressure only.